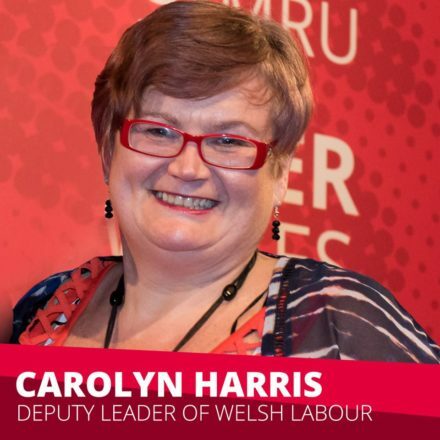 Carolyn Harris has won the Welsh Labour deputy leader election. The MP for Swansea East gained 51.5 per cent of the vote, narrowly beating Julie Morgan, Cardiff AM and former MP, to become the Welsh party’s first deputy leader. Although Morgan won a majority of party members’ votes, Harris won amongst affiliated groups and elected representatives. Campaigning during the race centred around the candidates’ preferred voting system, with Harris backing the current electoral college system and Morgan supporting a change to one-member-one-vote. Darren Williams, a member of both Labour’s national executive committee and the Welsh executive committee, took to Twitter to express his disappointment over the result. Momentum founder and chair Jon Lansman soon followed, calling the process a “travesty of democracy”. While Morgan’s bid was backed by Momentum, Harris was endorsed by unions including Unite and several members of the shadow cabinet. The MP was thought to have the support of Jeremy Corbyn’s office. The result was announced at Welsh Labour conference, which is being held this weekend in Llandudno. Speaking to conference, Harris said: “I never thought I would be an MP five years ago, let alone deputy leader of Welsh Labour. I will not let you down. “When we work together as a party we can fight anything. We are so strong together as a party and we can achieve anything. We can achieve in the assembly, in parliament, in local government, because the truth is this conference, Wales, needs Welsh Labour now more than ever. “As I have said throughout my campaign, I have got a big heart, a big mouth and you have trusted me and given me a big platform. “I said I would be a voice for all members, and I will. I said I will campaign in every CLP and I will. I said I would to more to empower and promote women and lay members and anyone who wants to be involved in our party. “I said I would build our party outwards, not just the 25,000 members but 3 million people in Wales who need us and need Welsh Labour. The work starts now. It starts right here and right now. I will never be able to thank you enough”. Harris was congratulated by First Minister Carywn Jones, who said he “looked forward to working with her very much”. Jones also gave his “heartfelt thanks” to Morgan for her campaign. The Swansea East MP is known for her strong campaigning record, particularly on fixed odds betting terminals and scrapping child funeral fees. She was congratulated on Twitter by Jeremy Corbyn and several members of the shadow frontbench, as well as backbench Labour MPs. Congrats to @CarolynHarris24 on being elected as @WelshLabour‘s deputy leader. Carolyn’s recent success in securing funding for child burials shows the passion and steel she’ll bring to her new role. Looking forward to joining her at our Welsh conference in Llandudno tomorrow.